“It’s not every day that you get to have a great beer and a great meal in a former church,” comments Matt. “If you want to do something different outside of Champaign-Urbana, hop on the interstate and come on over “expressed Matt Miller on a Friday evening. Matt is the owner of Monarch Brewing Company in downtown Monticello, Illinois. He knew that when the old church building in downtown Monticello went up for sale that it would be the perfect place to have a brewery. Matt grew up in a small town in Illinois and went to the University of Illinois at Urbana-Champaign for his bachelor degree. He has a background in physics and engineering, and was the President of a successful software company from 2006 to 2015. In 2015, Matt and his partners sold their company and Matt decided to do something new. He’d been homebrewing for about six or seven years at that point and wanted to do it full time. Matt spent nine months renovating the old church building to make it the perfect brewpub. He decided to name it Monarch Brewing Company because monarchs are the state insect, they contain all the colors of beer, and represent transformation. 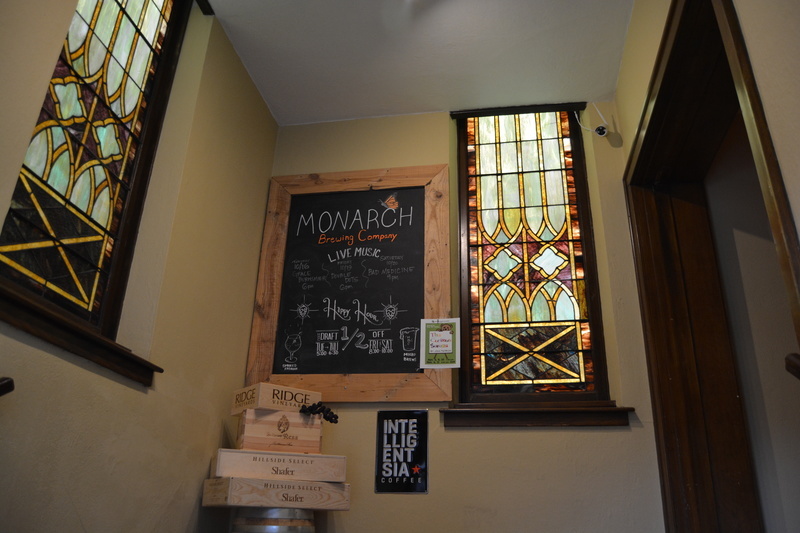 Monarch Brewing Company doesn’t stick to one style of beer, although they tend to brew ales. Most of the beer names are inspired by personal stories and local people, places, and history. For example, False Alarm was named from setting off the fire alarm twice during the initial brewing session. Additionally, the name for Allerton Amber Ale comes directly from the Allerton family and estate in Monticello. Matt isn’t surprised that there are so many breweries in Champaign County, and notes their incredible collaborative spirit and how they often all work together. Matt distinguishes Monarch Brewing Company from the rest by Monarch’s large interior space that is unique, customizable and versatile. “It’s not every day that you get to have a great beer and a great meal in a former church,” comments Matt. 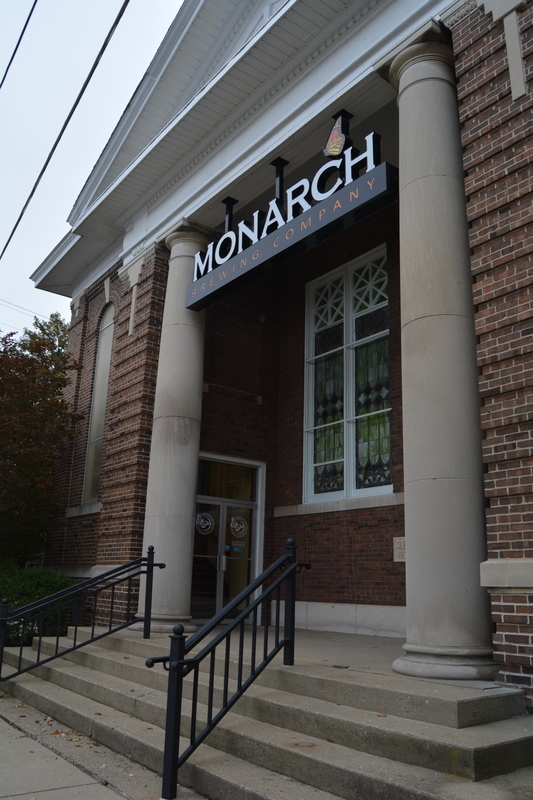 Entrance of Monarch Brewing Company: Front of building taken on E Main Street which shows front entrance. ~ Creator: Chrissy O'Grady ~ Date: Friday, October 19th at 3:50 pm. 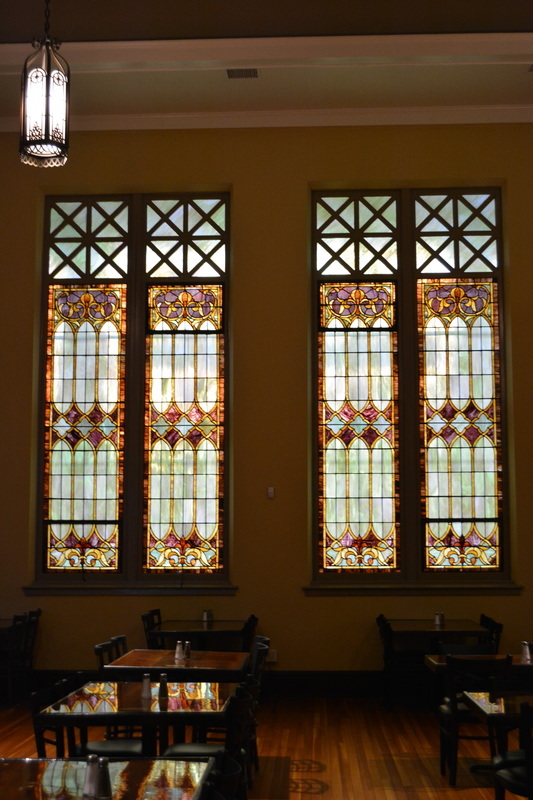 Stained Glass Windows in Monarch Brewing Company: Stained glass windows facing front of building towards E Main Street. ~ Creator: Chrissy O'Grady ~ Date: Friday, October 19th at 3:50 pm. Monarch Growler: Monarch growler looking towards stage and dining area. ~ Creator: Chrissy O'Grady ~ Date: Friday, October 19th at 4:30 pm. Entrance of Monarch Brewing Company: Entrance of Monarch Brewing Company with live music listed on board. ~ Creator: Chrissy O'Grady ~ Date: Friday, October 19th at 4:30 pm. 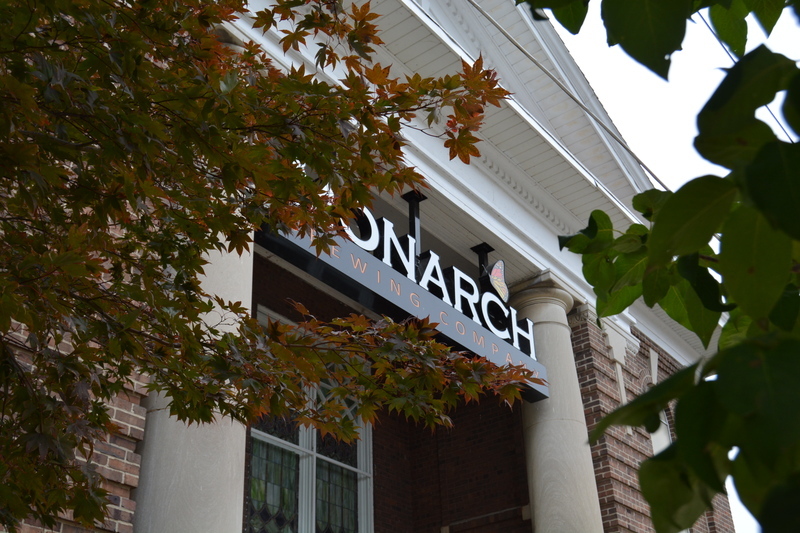 Monarch Brewing Company Logo: Monarch sign with changing trees taken on E Main Street. ~ Creator: Chrissy O'Grady ~ Date: Friday, October 19th at 3:50 pm. 212 S Independence St, Monticello, IL 61856 ~ From CU, take I-72 W until exit 166, take a left turn onto N Old Rte 47, turn right onto IL-105 W, turn left onto W Marion St and then left onto S Independence St.
Chrissy O'Grady, “Monarch Brewing Company ,” ExploreCU, accessed April 20, 2019, https://explorecu.org/items/show/424. “About - Monarch Brewing Company.” Monarch Brewing Company. Accessed November 4, 2018. https://monarchbrewingco.com/about/. Hammie, Jessica. 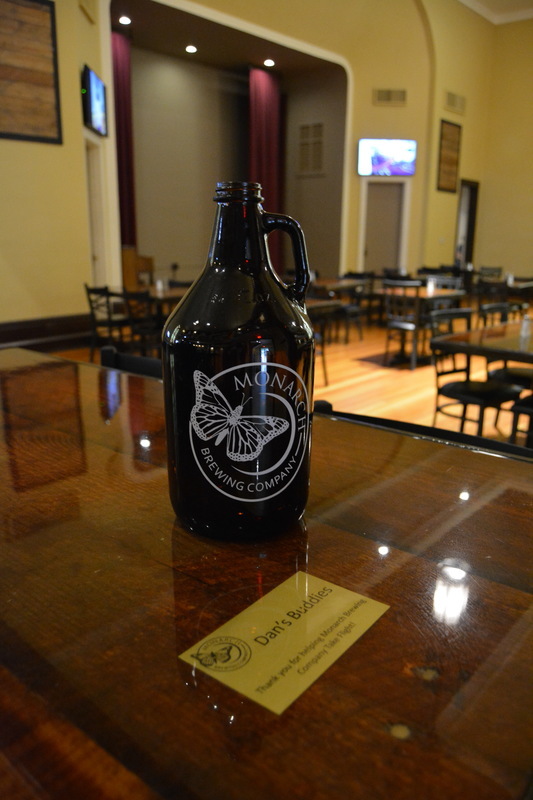 “Monarch Brewing Company: A New Brewpub Opens in an Old Place.” Smile Politely. 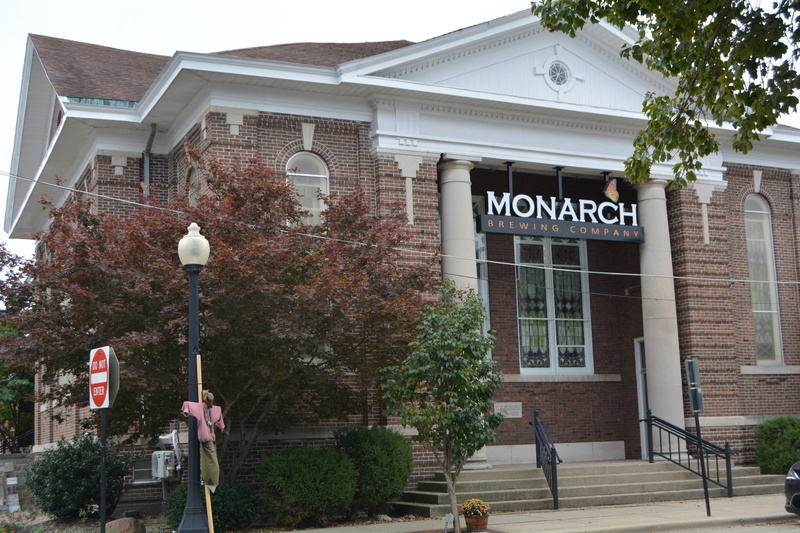 Accessed November 4, 2018. http://www.smilepolitely.com/food/monarch_brewing_company_a_new_brewpub_opens_in_an_old_place/. Helregel, Andrew. “‘So Far, so Good’ for Monarch Brewing Company.” Piatt County Journal-Republican. 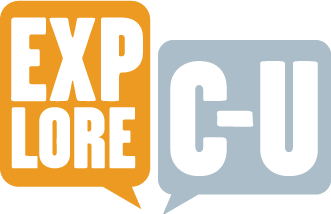 Accessed November 26, 2018. http://www.journal-republican.com/news/people/2017-06-14/so-far-so-good-monarch-brewing-company.html. Monarch Brewing Company. Interview by Chrissy O’Grady, 2018.